Allison’s GirlPhoria Lounges are short, pop-up afterschool live events that are sure to lead you on a path to intense happiness and self love! As the Girl Power Guru, she shares with you how to have a positive body image, find a little (or a lot of) self love, and some tips on figuring out what to do with your life! Oh and of course….free healthy snacks and some Yoga! Currently Allison only offers live events on Florida’s Space Coast. The next event is December 3rd from 5pm-7pm hosted by The Yoga Garden in downtown Eau Gallie Art District! Click HERE or the photo below to grab your tickets right away! Space is limited! Get your FREE Yoga Class Pass...along with tips, tricks and tools to get your happy on! My name is Allison...I am here to help you uncover your GirlPhoria and get you super happy, insanely in love with yourself, and find your strengths to run this world! Subscribe here to receive your FREE Yoga Class Pass...along with tips, tricks, and bonuses to help you get your happy on! 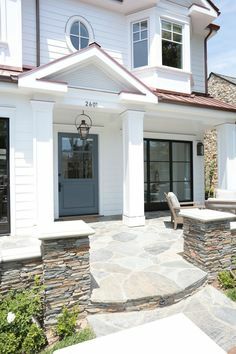 If you’ve been looking for a stylish way to update the exterior of your home, look no further than this collection of colorful front doors from the team at Style Me Pretty. 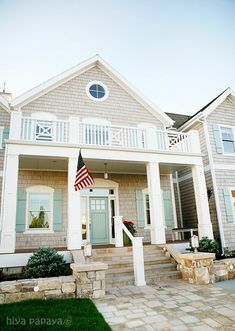 This traditional coastal home pairs bright white paint and natural stone accents with the gray-blue shade of Charcoal Blue. Explore the rest of the collection to find even more DIY design inspiration.